Billy Wagner is back again with the Mets but hopefully only long enough to make a deal to get him out of my sight for good. I’m especially hoping that Omar manages to swap him to the Yankees or Phillies, both of which need a lefty in the pen and deserve the kind of rotten fate a jerk like Wagner seems to bring along with his fiery fastball. Activating Wagner meant the Mets today released Livan Hernandez, who certainly seemed to have lost a grip on things lately but still seems a curious choice for unemployment with Tim Redding getting another astonishing stay of execution. Has any Met free agent pitcher in their history performed as badly as Redding this year and gotten so little credit for it? It’s taken season-ending injuries to three different starting pitchers to save him thus far, and he’s still not been reinserted to the rotation. (Turns out, he has: He’s going to take Livan’s start on Saturday). Anyway, so long No. 61. I thought you were OK. Hello, Billy. Don’t unpack too much. So the Mets are rattling into MFYankee Stadium with the burden of a few disappointing losses and maybe a bigger loss in the starting rotation. Initally scheduled to pitch the opener tonight, John Maine was pushed back, then removed altogether, going onto the disabled list with shoulder fatigue and the promise that some rest will do him good. The plan now is to have Livan Hernandez pitch Friday, promising but unproven Fernando Nieve to throw on Saturday, and recalling lefty Jon Switzer to take the place of Maine on the roster. We don’t know quite yet what number Switzer turns up in but we’d suggest 47 — which we gave away earlier this year to a lefty from Buffalo, Casey Fossum (remember him? I think he’s actually pitching in the MFYs’ system now). Anyway, Switzer’s a southpaw with a reputation for being hard on lefties, he may see some action this weekend. I won’t need to remind anyone the Mets are not looking particularly threatening right now but that’s just going to make this whupping of the Yankees a little sweeter. Let’s Go Mets! Check in when you see what Swtizer’s wearing! I never kept track of this stuff as well as some geeked out Met fans I know, but if I had to guess Livan Hernandez was probably the opposing starting pitcher I’d seen more often than any other over the last 10 or 12 years I’ve been going to games at Shea. And whether a Marlin, an Expo, a National or a Giant, I always found him an admirable opponent, the kind of guy with a million pitches and a determination to go down fighting, and so I was happy to see him acquit himself well in his first outing wearing our uniform tonight — as always, No. 61. Hernandez’s recall this afternoon meant that chubby veteran pinch-hitter Marlon Anderson was designated for assigment. Now, I liked Anderson, especially the first time he came around in 2005, but felt a two-year contract based on 100-some turns at bat following his release by the Dodgers in mid-2007 was going to be too much sooner or later. Guys like Anderson have to be rotated on a yearly basis, it’s the nature of the profession. I hope he winds up somewhere he can be more useful. He’ll be remembered here a three-number wearer, and the fraternities of 23, 18 and 9 thank you. It’s looking an awful lot like Livan Hernandez will make the team as both its fifth starter and fifth guy ever to wear No. 61, but I’m not counting on that quite yet. It seems to me that if all these opportunities for Freddy Garcia to get torched result in his getting some arm strength back that he’ll still be getting his chances right to the end, especially with Tim Redding likely to start the year on the disabled list and Jon Niese not too impressive so far. Anyway, I should say I’ve always admired watching Hernandez work — he’s an ox with a full repetoire, likely to throw any pitch at any count and looks like one of those guys who can nicked a few times each night but still hand over a winnable game to his mates and you ought not ask much more of a No. 5 guy. I’d be lying if I wasn’t a little disappointed that Rocky Cherry hadn’t gotten a better shot at cracking the Met bullpen, but the good news is the Rule 5 pick from the Orioles isn’t headed back to Baltimore so fast. The O’s refused the Mets offer, and the Mets subsequently released Cherry but word is they’re trying to sign him to a new deal and stash him in Buffalo. The Mets in the meantime are looking to audition pitcher Fernando Nieve and veteran infielder Junior Spivey whom they both acquired in recent days. Nieve is a live-armed lottery ticket snatched on a waiver claim from Houston. He’s had some arm trouble in the past but reportedly brings it in the high 90s. He wore No. 64 in a few appearances with the Astros last year. Spivey is the former Diamondback infielder (No. 37) and a member of the Snakes’ blessed 2001 World Champs. He most recently was released by the Red Sox in spring training and played independent ball last season. The Mets.com roster doesn’t show these fellas with assigned uni numbers yet — let us know what you see. 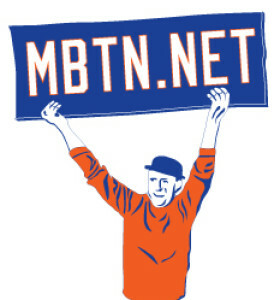 I’ll be speaking about the Mets, uniform numbers, the MBTN book and anything else that comes up next Wednesday, March 25, at 7:30 p.m. at the Bryant Library in Roslyn. I will have a few books on hand to sell ($10 cheap!) and/or sign. The Bryant Library is located at 2 Paper Mill Rd. in Roslyn. I hope to see you there. This just in: Jose Valentin is in camp and been assigned No. 99. Later: Looks also like Bobby Keilty is wearing No. 62. Livan Hernandez, as pointed out in the comments, is in 61. Still more later. In the meantime, now that everyone’s in camp, photos and eyewitness reports should be rolling in — if you can help “fill the gaps” please let me know and thanks!